Bed-wetting affects as many as one in 10 six year olds. While the situation can resolve itself with time, living with the situation can be stressful for both parents and their children. Conventional solutions revolve around containing the problem, rather than looking to address the root cause. You may have tried drugs like Desmopressin to inhibit urine production, or a moisture-activated alarm system. Bed-wetting can be quite stressful for children and parents especially if the problem persists to an age when the child is attending school camps or gets invited for sleepovers. Dr Mahoney's research showed that all these children had pronounced narrowing of the palate and believes this contributes to their breathing problems. Dr Mahoney has achieved dramatic results by fitting a brace to help widen the palate. A Swedish study found that 7 out of 10 bed-wetting children improved within a month of using a similar device and a UK-based study found that all the children who used a brace stopped wetting the bed. And breathing problems often have more serious consequences than bed-wetting, such as enlarged adenoids/tonsils, glue ear, respiratory infections, asthma, allergies and chronic cough. Problems at school, learning difficulties, behavioural problems hyperactivity and headaches are also linked to dysfunctional breathing. A dental brace may not be necessary – the first thing you need to address is the mouth-breathing habit that causes the narrow palate in the first place. Nasal breathing and correct tongue posture is the key to resolving bed-wetting in children and in most cases this can be achieved without the need for dental appliances. The tongue functions as a natural brace when nasal breathing is restored. We teach children simple, easy-to-learn breathing exercises that are practised daily for 4-6 weeks. 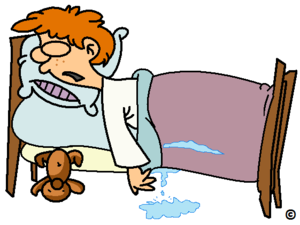 In the majority of cases bed-wetting stops within a few sessions. The programme helps restore a natural breathing pattern and correct nasal breathing habits. Improvement usually occurs within a few days. By the end of the course, most children are breathing easily and can put their bed-wetting days behind them. Other breathing-related conditions including swollen adenoids, glue ear and disturbed sleep also resolve as breathing returns to normal parameters. Children who mouth-breathe are more prone to enlarged adenoids/tonsils, glue ear, respiratory infections, asthma, allergies and chronic cough. These children are also more likely to suffer from night-time enuresis (bed-wetting). If this habit is not corrected, it can lead to crooked teeth, receding chin, protruding nose, narrow airway and a high risk of developing obstructive sleep apnoea, respiratory disorders and cardiovascular risk as adults.